Winter is coming. And many of our fellow countrymen have an opportunity to think about and choose their active holidays. Tignes, Les Arcs, Bourg Saint Maurice are the most beautiful places of the French Alps. The most difficult ski slopes as well as simple and well-organized slopes for beginners are just created to attract that lovers of mountain skiing who have not yet gained experience and become a master in their favorite winter activity. Tignes ski resort is located at a height of 2100 m and 165 km from the international airport of Swiss Geneva. Eye pleasing landscapes of the Alpine foothills are not the only main advantage of the resort, but also the diversity of the ski slopes, as well as hotels proximity to them. The infrastructure, according to the review of the travelers who like mountain skiing, is one of the best in the French Alps. Tignes consists of three main stations: Val Claret, Tignes-les-Lacs and Lavash, but the trails for beginners are concentrated mostly only in the last two stations. On maps of the routs the areas for beginners are specified as Ski Tranquille, and they are located between Tignes and its famous neighbor - Val d'Isere. There are about ten of such slopes which will allow beginners to learn not only to stand on skis confidently, but also skiing experts can sharpen their skills here. In addition, there are five free of charge lifts in these zones. 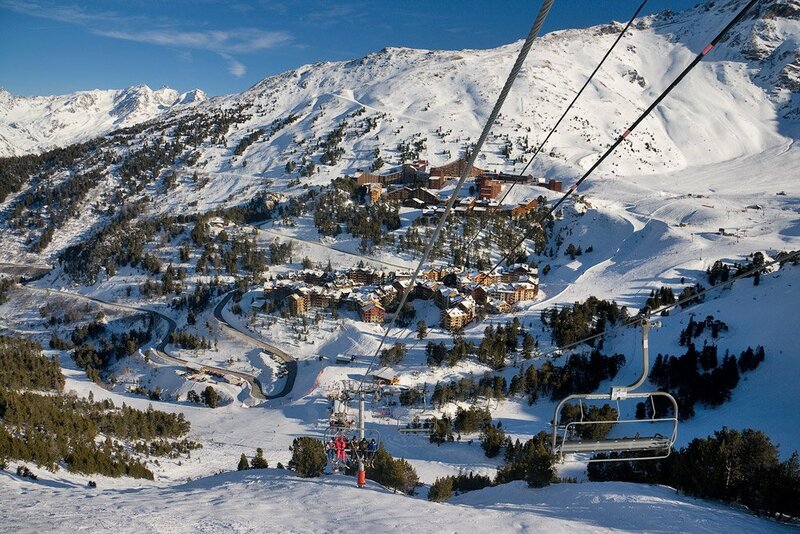 Another great place for amateur skiers is Les Arcs. The resort is located in the famous Paradi-ski region (more than 400 km of trails), and consists of La Plagne, Peisey Vallandry and Le Coch. The nearest airports are in Chambéry, Grenoble, Turin and Geneva, and the way to the resort and back takes from 2,5 to 5 hours. Organization and infrastructure in this place of resort is at the highest level. According to the tourists' reviews, Les Arcs is one of the places where you can put skis on right off the door. Along with two ski schools, you can practice here both in a general group and with an individual instructor. The main areas for beginners training are near to Plagne Bellecôte and Plagne Center stations, located at a height of 1930 km and 1970 km. Lez-Ark is rich in green and blue trails for beginners. Their length is the longest in this place of rest, and in total it is 150 km. And to get to the slope, you can use a cheap ski pass for a few lifts valid for several days. Children up to 7 years old and the aged people (72 years) are lifting to any route for free at all. Bourg-Saint-Maurice is a small town, and Bourg Saint Maurice with Les Arcs create a combined ski area. But, despite the fact that the resort is not large, and is a kind of backwater in comparison with its famous neighbor, it is friendly and welcoming for beginners and lovers of mountain skiing. Not only world speed records used to be set at the peak of the local slope (in some areas the grade of the mountain slope reaches 75 degrees), but infrastructure and hotel business are also used to be developed well and when required. The most beautiful panorama opens from the cozy houses of the French Alps. In conclusion, I wish to say: if you are a mountain skiing beginner you can choose any of the above mentioned places and in each of them you will find your own special color. So don’t hesitate to take your favorite skis with you and go on, towards adrenaline and speed! The best ski slopes for beginners in the French Alps are waiting for you!